Lincolnshire is understandably known as ‘Bomber County’. Airfields once littered this part of the world, and many have now gone, returned to agriculture, used for housing developments or industrial sites. The names of those who served there linger in street names, Spitfire Way, Lancaster Ave etc. In some respects, it brings me closer to my father’s experiences as he was based in this county at the end of his service. He talks fondly of Lincoln and stations such as RAF Manby. His memory, a little jaded now, hangs on to snippets of events in his life. 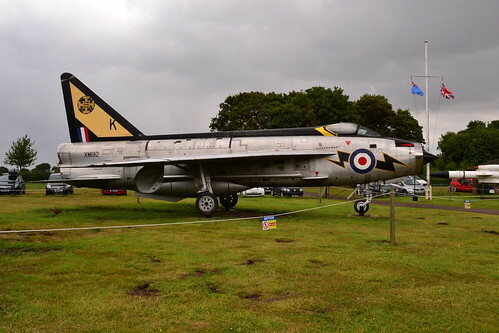 BAC/EE Lightning parked at Coningsby. So our trip around the area included places both old and new. It will include an active airfield, two former airfields and two museums. A busy day out but a remarkable one. Driving north through the Lincolnshire Fens, we head toward RAF Coningsby, one of the few active fighter airfields left. 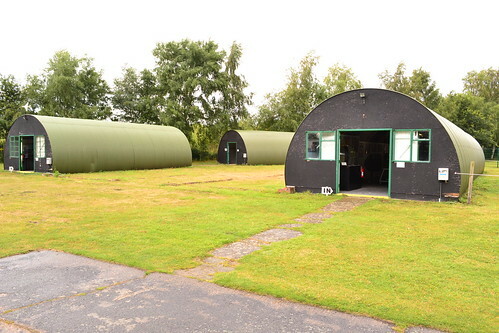 A large open expanse with excellent viewing facilities located in a number of places around it, it is nestled on the edge of the village where extensive RAF housing can be seen. The designated viewing area is at the end of the runway and offers a great opportunity for photos and plane spotting. There seems to be a hardened crew of enthusiast permanently perched here with enormous telephoto lenses. A short distance toward the village finds the BBMF museum with its well stocked shop, super little museum and of course tours through the hanger of the famous BBMF. Taking yourself back, round the airfield, diverting to a closed crash gate, you can see a BAC Lightning perched in one corner. 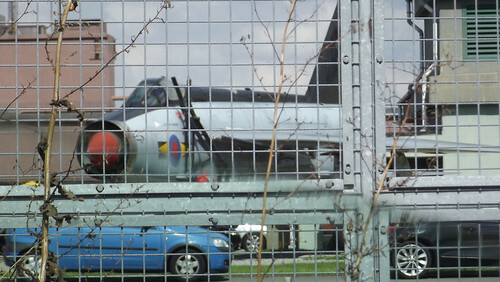 Match this with the Phantom at the main gate and you have a good idea of previous residents of the airfield. Moving on to the other end of the runway, will place you nicely for photographing approaching aircraft as they come over the road, gear down and at a speed slow enough to get a half decent picture from – if you don’t have all the fancy equipment adoring the necks of the ladder clad (no offence) spotters that is. Coningsby often sees visiting aircraft from overseas. 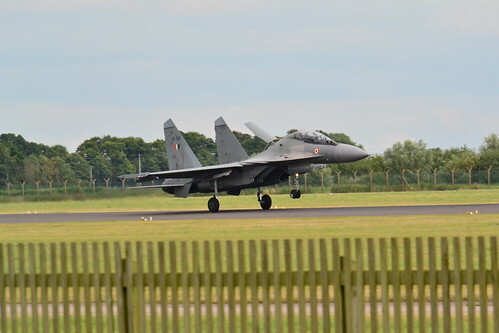 In July 2015, after my initial visit, four Indian Airforce Sukhoi Su-30 MKI “Flankers” arrived for a two-week long operation in conjunction with the RAF Typhoons from Coningsby. A good opportunity to see Russian designed aircraft in the Skies over Britain. They brought with them a C-130 Hercules and C-17 Globemaster. More excellent photo opportunities for the enthusiast. Additional photos are on Flickr and a detailed write-up can be found on Tony Wilkin’s ‘Defence of the Realm’. One of the “Flankers” landing at Coningsby. On a good day, you may get to see the Typhoon display team, practice sessions or the BBMF running up their aircraft. A sight to behold. 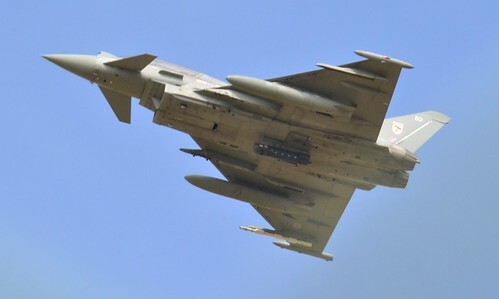 Come to Coningsby, on a warm day, have sandwiches and a camera and set yourself up for superb viewing and great day out. Leaving Coningsby, head toward the old Woodhall Spa airfield a few miles up the road, to the north ,and a stark difference. RAF Woodhall Spa was originally built as a satellite to RAF Coningsby a short distance away, and opened on 1st February 1942. It was built with three concrete runways; two of 1,400 yds (1,353 m) and a third and main runway of 2,000yds all 50yds (46 m) wide. 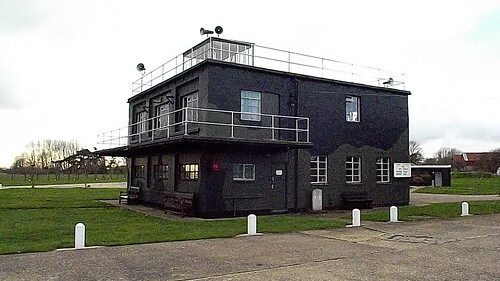 The site like other Standard ‘A’ class airfields had two T2 hangars and one B1, thirty-six pan-style hardstandings and numerous support buildings scattered around its perimeter. Accommodation was spread over 7 sites, along with a WAAF, sick quarters and 2 communal sites all located to the south-east. 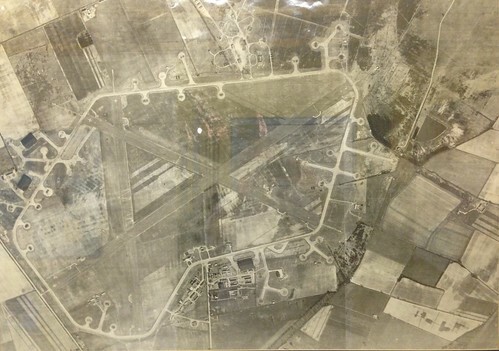 The technical and administrative sites were also to the south-east side of the airfield between the accommodation areas and the main airfield. A bomb store was well to the north and the main entrance to the north-west. A range of accommodation and technical style huts were used, Laing / Nissen / Seco and a Watch Tower to drawing 15956/40. An aerial photograph of Woodhall Spa taken post war. The B1 and T2 hangers can be seen to the north-west, a further T2 to the south. The accommodation block are below the frame. (Taken from a photo at the Thorpe Camp museum). One remarkable features of Woodhall Spa was the installation of six arrester gear units on the runways. These were designed to prevent aircraft overshooting the runway and were installed during the building programme. Some 120 units were manufactured in all but only a handful of sites had them. On October 22nd 1942, the Woodhall Spa units were tested using an Avro Manchester from the Royal Aircraft Establishment and all went well. However, as the war progressed, reservations were registered about such a technique and the units were never used ‘operationally’ in any of the allocated sites. At the same time that Woodhall Spa opened, the newly equipped Lancaster (Mk I & III) squadron, 97 Sqn, moved from RAF Coningsby into RAF Woodhall Spa and within a month were flying operations from their new home. However, their first operation, mine laying, was to be fatal for three aircraft, cashing on the journey home. This was not to be the general theme for 97 Sqn though. For the next year they would prove themselves more than capable, hitting many targets accurately with bravery and courage. The following March (1943) the main bulk of 97 Sqn moved to Bourn to form part of the new Pathfinder force, with detachments at Graveley, Gransden Lodge, Oakington and a further section remaining at Woodhall. On April 18th 1943, 619 Sqn was formed from the Woodhall Spa detachment retaining their Lancaster Is and IIIs. However, their stay was very short; they moved out to Coningsby in January 1944 and were replaced overnight by the famous 617 (Dambusters) Sqn*5. During their year here, 619 Sqn would prove themselves further in raids over the Ruhr, Düsseldorf, Oberhausen and Krefeld. Casualties were light during these early missions, but in the following August (1943) the RAF a mounted a massive raid consisting of 596 aircraft on the V2 rocket site at Peenemunde. Three of the twelve aircraft sent by 619 Sqn would fail to return. 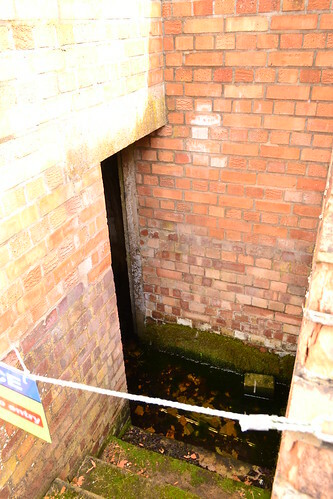 The bomb shelter now flooded and inaccessible. When 619 Sqn moved out, 617 Sqn moved in. Lead by Group Captain Leonard Cheshire, 617 Sqn were the elite of 5 Group, Bomber Command and accordingly were to be assigned some of the most difficult and outright dangerous precision bombing missions. Throughout 1944, 617 Sqn would have many near misses, and losses, ranging from low-level bird strikes to fighter attacks and flak. 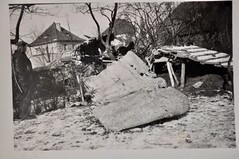 Targets varied considerably including those at: Limoge (aircraft engine factory), the Antheor Viaduct, Albert, St. Etienne and Metz (aircrafts parts factories); many using the new ‘Tall Boy’ 12,000lb bomb. On 15th April 1944, 617 Squadron were joined by 627 Sqn and obtained some D.H. Mosquito VIs, using these to good effect in the Pathfinder role while their Lancasters continued with the bombing. In June, they had a small respite from bombing missions and on the day of the Allied Invasion, they were tasked with dropping ‘Window’ over the Pas-de-Calais to fool the Germans into believing the invasion force would strike there. A handful of huts and buildings remain. Throughout the remainder of 1944, 617 Sqn continued to use ‘conventional’ and Tall Boy bombs on prestige targets like U-boat pens and the Samur Tunnel. 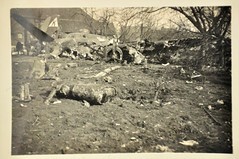 Cheshire found himself handed a P-51, and after having it unpacked and engine tested, he used it to mark a V1 target to which 617 struck a devastating blow. Further major targets were to befall the wrath of 617 Sqn. Flying 2,100 miles to a forward operating base at Yagodonik with Lancasters from 9 Sqn, they attacked the German main Battleship the ‘Tirpitz’. During the mission, for which they had long-range fuel tanks, of the 38 aircraft that set off, six were to crash on the outward journey, one turn back and one to crash on the return. The Tirpitz however was to remain ‘unsinkable’ for some time. It would take two more return trips by 617 Sqn from Lossiemouth to finally sink the ship, the last being on 12th November 1944, with the loss of 1000 German sailors. Bombing and pathfinder operations for Woodhall spa crews continued right up to the end of the war. Early that year they would start to use the new ‘Grand Slam’ 22,000lb bomb, with their last operational fatality being on 16th April 1945. That was not the end for Woodhall Spa though. The famous Guy Gibson drove here and ‘borrowed’ a Mosquito of 627 Sqn against a backdrop of changed minds, mishaps and misjudgments, the resulting crash leaving him dead. 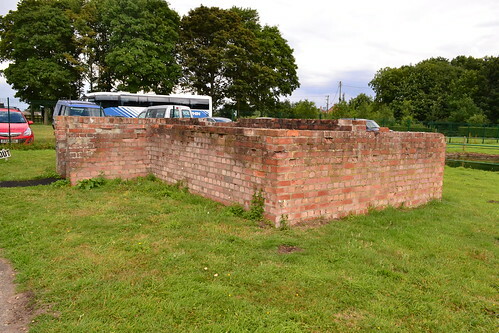 Brick walls outline former structures. 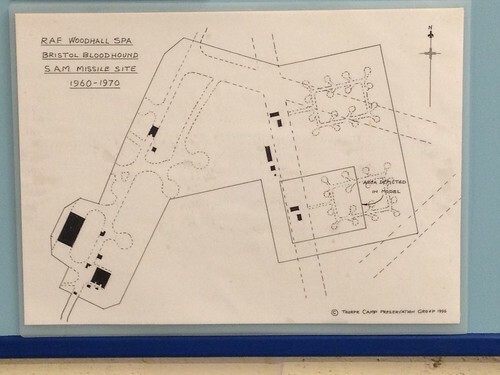 Woodhall closed soon after the war ended, but it was identified as a suitable location for Britain’s air defence missile the ‘Bloodhound’ and on May 1st 1960, Woodhall Spa became the base of 222 Sqn with Bloodhound MkI missiles. These were disbanded in June 1964 and replaced by Bloodhound Mk IIs of 112 Sqn on November 2nd 1964. These stayed until 1st October 1967 when they moved to Episkopi in Cyprus. After the removal of the Bloodhound squadron, the RAF continued to use a small site near to the main entrance, utilising the 617 Sqn T2 hangar and other ancillary buildings as an engine maintenance and testing facility. This too has since closed and the main use is now as a quarry. A long and distinguished life, Woodhall Spa’s operational losses totalled 91 aircraft, of which 74 were Lancasters and 17 Mosquitoes. 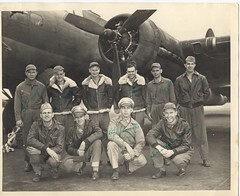 Daring and brave crews, they gave their all for freedom and the love of flying. Today little exists of this former airfield. Being a quarry and partly MOD land it is not accessible to the general public. Most of the buildings have long since gone and the runways mostly dug up. A few minor concrete ‘side roads’ are in situ and with searching some evidence can be found. The tower was demolished just after the war as were many of the other buildings and huts. Although there are steps being taken to turn whats left into a nature reserve (see post dated 4th July 2015) it really is too late for this airfield with its incredible history. The best remnants can be seen a little way to the south-east at the former No 1 communal site at Thorpe Camp (see below). The former NAAFI for 469 airmen and 71 officers. A small number of buildings remain here utilised now as a museum. These include a war-time NAAFI able to accommodate 469 airmen and 71 officers, the ablutions block, ration store and various Nissen huts. A bomb shelter is also here, now flooded and blocked off along with other part brick structures. In the adjacent woods, the airmen’s quarters and other buildings can be found, now derelict and in a dangerous condition. Odd buildings are scattered about the various sites but these too are few and far between. 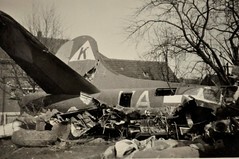 Considering the history of Woodhall Spa, the men who flew from here, the operations they undertook, the testing of revolutionary equipment, the new and deadly bombs, it has suffered possibly greater than most and much of this history, if it were not for the Thorpe Camp museum, would now be lost forever. Perhaps if it becomes a nature reserve in part, then maybe, just maybe, the footsteps of those who were stationed here may once again be walked by others and their memories brought back to life. Thorpe camp museum*1 sits on the original communal site 1 on the former RAF Woodhall Spa and was acquired in 1988 by a group of volunteers (The Thorpe Camp Preservation Group) who have utilised the original buildings and pathways that would have been used by RAF personnel during their stay at Woodhall Spa. Entrance is a nominal fee and worth every penny. Original buildings of No. 1 communal site are now a museum. A number of original huts and buildings display a range of letters, photos, memorabilia and other artefacts that take you through aspects of life both at Woodhall Spa and Lincolnshire life during the Second World War. Specific displays tell you about each of the four squadrons based here (97, 617, 619 (Dambusters) and 627) , the crew members, aircraft and personal stories. 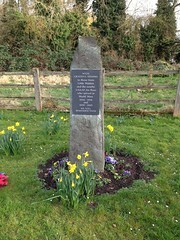 A memorial stands at the centre of the site reflecting their dedication. Extensive work has been done to research the famous dams raid of 617 Squadron, how the bouncing bomb was developed, how it worked and what the aftermath of the operation was. A small shop provides food and drink, and is a welcome break after a long journey. 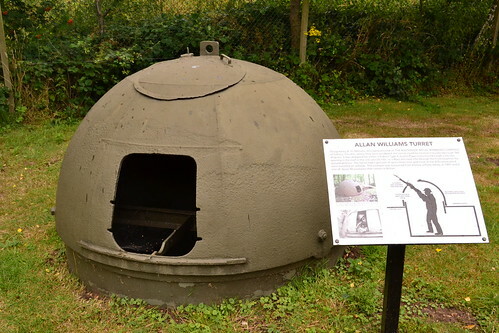 An Allan Williams Turret on the site. A civilian section shows life ‘at home’. Weddings of the Second World War were scant affairs due to lack of money and rationing, but brides made the most of what they had; examples of these are nicely displayed. The home guard, ARPs, and domestic life are all represented in this atmospheric museum. Many young men were sent from within the borders of Lincolnshire on major operations such as ‘Market Garden’, these too are represented through displays of uniforms, photos, letters and official documents. Further buildings, also originals, house well stocked displays of the V1 and V2 development. The terror weapons used by Hitler to break the morale of the British people. Over 3000 of these V2s were used against targets in the UK predominately London and the South East. Models, photographs and documents again show the extent of this development. Something I had never come across before was the idea of using arrester gear on heavy bombers where runways may have been shorter than ideal. The principle, based upon that used by the navy on their aircraft carriers, was to place one or more steel cables across the runway for a landing bomber to ‘catch’ as it landed. A small number of airfields in the UK has these, Woodhall Spa being one of them, and an original winch has been removed from the airfield and carefully refurbished. This now has pride of place in the museum. 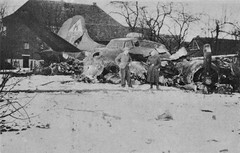 It is believed a further example remains on the airfield alongside the remains of the runway. A rather ingenious but ineffective idea, it was not widely used due to mis-landings and the increased weight that the arrested gear added to an already heavy aircraft. 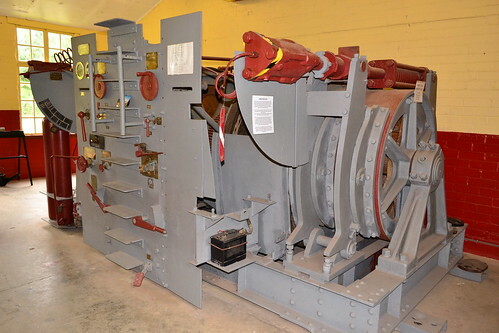 An arrester gear hub that was used on RAF Woodhall. Thorpe Camp provides a chance to see inside a Lancaster cockpit. A replica, painstakingly built includes all the detail of an original Lancaster bomber. Other parts, including turrets, dials and engines can also be found in this dedicated exhibition room. Staff at Woodhall Spa are carrying out renovation projects and have their own workshop to do this. The process can be viewed and makes for an added interest to the visit. As an aviation enthusiast the trip is topped off with another feature in the form of a BAC Lightning F1A (XM192) in 111 Squadron markings standing proud beside another cold war relic the Bristol Bloodhound missile. 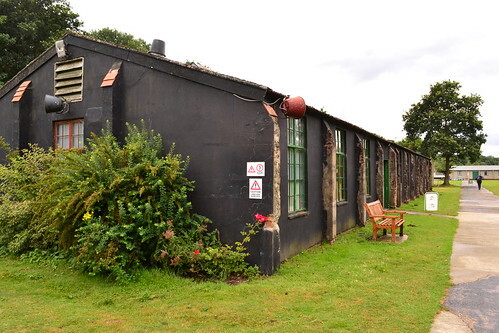 Using a range of original documents, photographs, letters and memorabilia, Thorpe Camp at Woodhall Spa is a delight to wander and a real insight not only into the life of this Second World War airfield but life during those hard times in general. On leaving here, driving toward Woodhall Spa village, you used to pass a two-seat hunter on the right*2. Bought by a farmer for a restoration project, it seemed to have been left and was deteriorating in the open. Many parts were missing and / or damaged. Research has shown that it is in fact made up of two Hunters joined together and not an original. As you enter the village of Woodhall Spa, you are greeted by the ‘best towns’ award. A beautiful little village with a crossroad at the heart. Adjacent to this is a small car park and the famous Dambuster’s memorial, depicting a breached dam. 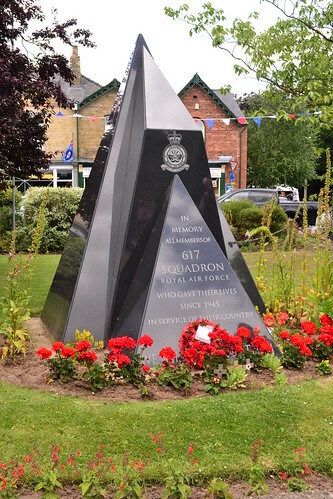 Memorial to the Dambusters in the centre of Woodhall Spa village. The names of the crew adorn the side, reminding us of those brave men who sacrificed themselves for this controversial raid. Whatever you think, it is a moving piece and you cannot but stand in silence contemplating it’s significance. A further memorial has since been added in this small park, specifically for 617 Sqn, including references to post WWII operations. 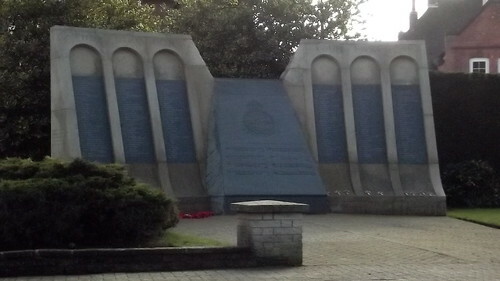 A recent addition, the 617 Squadron memorial dedicated to those who served post 1945. This For those requiring a small break, there is a cake shop in the village “Janet’s” which sells a good cup of tea and refreshments. “Janet’s” is full of RAF memorabilia, every inch of the wall is covered – a fascinating place to sit. Further up the road away from the memorial, you pass a long leafy road with a sports centre on your left. On your right after the woods, is the sign for Petwood Hotel. 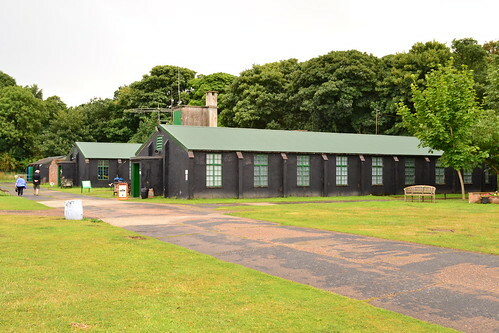 A formidable building, used by Guy Gibson and his crews as a mess hall whilst based at the nearby airfield. In the Squadron bar, are pictures and memorabilia of those times, which you can look at whist having your afternoon tea. 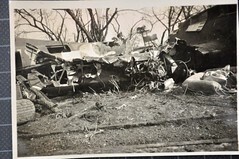 One notable artefact above the bar is the large branch of a tree that was struck by a low flying Lancaster, punching its way through the Plexiglass bomb aimer’s window. The hotel allows you to wander at will through the old bars taking in the amazing history of the place. 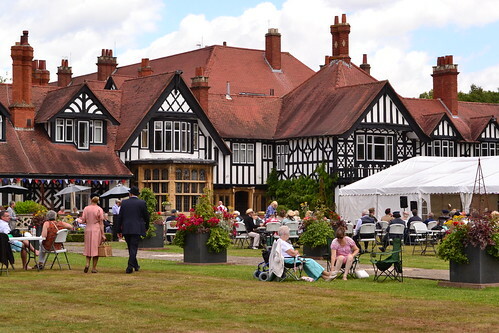 The Petwood Hotel hosts many activities relating to the 1940s, housing memorabilia of 617 squadron and was home to the officers of the Dambusters. A fabulous place for afternoon tea too. On leaving Woodhall Spa, you are heading back toward Coningsby, turning east toward the old airfield of RAF East Kirkby. As the Lincolnshire countryside unfolds before you, and you can just imagine (in-between the sounds of jet engine) the Merlins, rumbling above you. 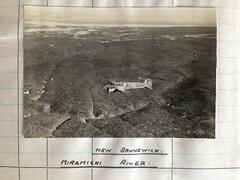 Here is a relatively little known airfield, where a real story has unfolded. A taxiable Lancaster ‘Just Jane’sits proudly in its hangar, next to a Dakota. Purchased by two brothers, ‘Just Jane’ regularly taxis carrying fare paying passengers around the airfield. The long-term project is to return her to flight giving two airworthy Lancasters in this country – what a sight to be hold. Around the aircraft are the stark reminders of the darker side of aviation. Bits taken from crashed aircraft along with photos, personal artefacts recovered from the sites, and a range of military vehicles all add to the historical content of the trip. 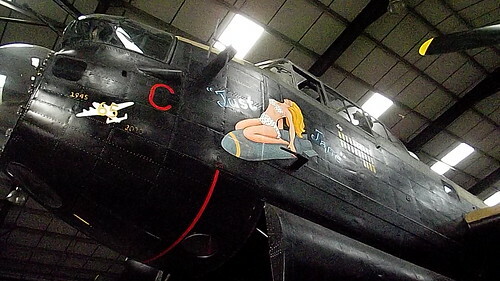 Lancaster ‘Just Jane’ still lives through live taxi runs. The museum*3 is very well laid out. A good, clear guide tells you about the history of the site, the individual buildings (which are superbly renovated) and all the displays which are housed in huts. It even points out the bullet hole in the flag pole from the marauding German night fighter. Many of the displays were new to me and a very pleasant surprise to see, considering the nature of the trip. The watch tower, one of the best preserved in this country, has mannequins, sounds and artefacts set out as it would have been when waiting for ‘the boys’ to return from one of their war-time sorties. The renovated Watch Tower – now a part of the museum. After sampling refreshments in the lovely little café, head back home, leaving bomber country behind and some fantastic memories of a great day out. *1 The Thorpe Camp museum have a website. The museum was visited in July 2015 and this page has been updated since. *3 The East Kirkby Museum have a website which can be found here. *5 617 Squadron are most famous for the raid on the Ruhr dams in Operation Chastise ‘Operation Chastise’ carried out on 17 May 1943 under the command of Wing Commander Guy Gibson. on page 50-53 of Volume 1 of our books a story of East Kirkby and photo maintenance on the Dakota. One of the 172 places with Towers we visited. Dear Andy, This has long been one of my most favourite trails of yours. You know why. It captured my imagination with its nostalgic trip back into the past, into the days of World War iI, where my heart has always been. Thank you for the journey. Since I read it so very many months ago, it has indeed been a journey. You are truly one of a kind. Keep up the excellent writing and the unparalleled personal touches that make the blog so special. Just to let you know, that the Hunter you talk of on the way into Woodhall Spa has now been sold and is no longer there.. All the best.. David. Many thanks for commenting David. I was aware that since the visit it had been moved to somewhere else. But I wasn’t aware that is had been sold, hopefully to a good home for some TLC. Thanks again, please do let me know if you know where it went.